Fourteen subspecies are recognized by Clements et al (2016) and 12 by Gill and Donsker (2017). Of the 12 subspecies recognized by Gill and Donsker (2017), six occur only south of the United States. The others are: alascensis of southeast Alaska and southwest Canada, harlani of central Alaska and northwest Canada, calurus of western North America, borealis of eastern North America, fuertesi of the southwest United States and northern Mexico, and umbrinus of Florida, the Bahamas, and Cuba. Gill and Donsker (2017), Pyle (2008), and Wheeler (2003) treat kriderii as a pale morph of borealis, which we follow here. We include the northern subspecies abieticola (Todd 1950, Wheeler 2003, Liguori and Sullivan 2014). As pointed out by Gill and Donsker (2017), harlani may be specifically distinct (see harlani account below). We accept four subspecies occuring in Nebraska: borealis (including kriderii), abieticola, calurus, and harlani. Nebraska breeding birds are borealis (Wheeler 2003), although breeding Red-tailed Hawks in the western third of Nebraska are likely to be intergrades with western calurus as well as kriderii, which nests in extreme northern and northwest Nebraska, including cliff faces (Carriker 1902, Bruner et al 1904, AOU 1957, Wheeler 2003). Calurus, and harlani are regular migrants and winter visitors, calurus statewide and harlani mostly in southern and eastern Nebraska, and recently-recognized abieticola is currently considered casual but is likely also of regular occurrence. Many wintering birds are dark morphs; Rosche (1994) indicated that in some years these outnumber pale morphs in the Keith Co area. A total of 93 birds in Dodge Co 30 Dec 2007 and Sarpy Co 7 Jan 2008 included five harlani, 11 dark morphs, and one rufous morph. Occasionally white (leucistic or possibly albinistic) birds are reported, usually in migration, but one was paired with a normally-plumaged bird in central Nebraska 31 Mar 2010. An apparent near-albino (red eye, “touch of red” in tail) in Frontier Co 4 Dec 2016 was likely the same bird that had been wintering there for 6-8 years (T.J. Walker, personal communication). Subspecies borealis: Common regular spring and fall migrant statewide. Fairly common regular resident statewide. Common regular winter visitor south, uncommon north. Borealis morph kriderii: Rare regular spring and fall migrant statewide. Rare casual breeder northwest. Rare casual winter visitor southeast. Documentation: Specimens: UNSM ZM7666, 9 Sep 1917 Lancaster Co (borealis); UNSM ZM11452, 16 Jul 1965 Fort Robinson SP, Dawes Co (kriderii). Taxonomy: Borealis intergrades with calurus in western Nebraska, and the pale morph kriderii breeds only in extreme northwest Nebraska (Wheeler 2003). Resident: Most Nebraska breeders are resident (Wheeler 2003); apparent pairs of light-colored birds are often seen during winter. BBS data 2007-2013 (Sauer et al 2017) indicate breeding Red-tailed Hawks are evenly-distributed across Nebraska and have increased annually at a rate of 3.58% (95% C.I. ; 2.58, 4.51) during the period 1966-2015. Migration dates are difficult to discern, although numbers peak in Mar, presumably migrants (borealis) from the northern parts of the species’ breeding range. Wheeler (2003) noted that northward movement of adult borealis and calurus begins at mid-latitudes in late Feb, peaking in numbers mid- to late Mar, with juveniles straggling into Jun. Reports of kriderii suggest later movement in spring than calurus or borealis; a rather late kriderii was photographed in Johnson Co 2 May 2017, but one in Sheridan Co 24 May 2011 was within the Pine Ridge breeding range. Rosche (1994) stated that in the Keith Co area “most” of the paler breeding birds arrive in Mar and depart in Oct-Nov, presumably a reference to kriderii. High counts 100+ on 2 Mar 2003 in Gage Co, 56 on 26 Mar 2000 in Sarpy Co, 80 in 300 miles of I-80 9 Apr 2018, and 44 between Omaha and Grand Island along I-80 23 Mar 2002. Fall: As in spring, movements of borealis are difficult to discern, although High Counts suggest peak movement in late Oct. Hitchcock Nature Center Hawk Watch, Pottawattamie Co, Iowa data show migration of Red-tailed Hawks beginning mid-Aug, with highest numbers occurring throughout Oct; average total yearly count through 2016 is 2778 (Hawkcount.org 2018). High counts: 208 over Omaha 23 Oct 2009, 52 over Bellevue, Sarpy Co 22 Oct 2000, 38 at Fontenelle Forest, Sarpy Co 21 Oct 1997, and 38 in Lancaster-Seward Cos 16 Dec 2001. Winter: Red-tailed Hawks winter statewide but are unevenly distributed. CBC data show that they are about five times more numerous per party-hour in the east than in the west. Since 2000, the total number counted on Nebraska CBCs has varied from 262 to 550 and over the 115 years of the CBC, birds per party-hour has increased from virtually zero in the 1940s to around 1.0 in 2014. It was considered uncommon to rare in the northwest (Rosche 1982) and uncommon to rare in the western Sandhills (Fred Zeillemaker, personal communication) during winter. 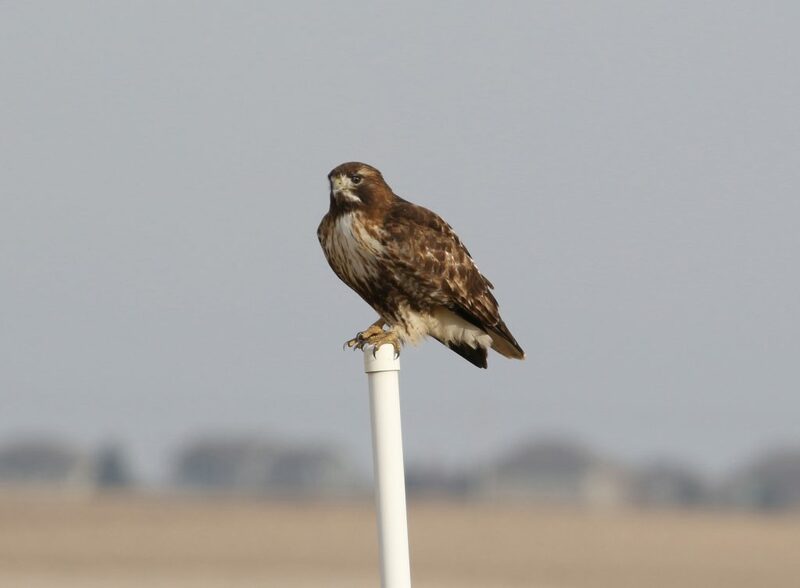 Lingle (1989) found it to be the most common Buteo along the lower reaches of the North Platte River, counting 10.8 birds per 100 km of highway, although similar counts in the east in 2013 found 48 in 65 miles (46 per 100 km) in Washington and Burt Cos 13 Jan, and 31 in 67 miles (29 per 100 km) in Dodge Co 6 Jan. A roadside survey of wintering hawks in Nemaha Co in 1980-81 and 1981-82 estimated a winter density of 0.28 per square kilometer (Shupe and Collins 1983). Northern Red-tailed Hawk south of Papillion, Sarpy Co 28 Mar 2018. Photo by Phil Swanson. Status: Rare casual winter visitor east. Documentation: Photograph: 14 Jan 2018 Otoe Co (Manning 2018). Taxonomy: This subspecies is considered by many recent authors a dark form of borealis, grading clinally with that subspecies in the northeast US. However Red-tailed Hawks with heavy markings occur throughout the breeding range of borealis, not only where abieticola was first described (Todd 1950, Wheeler 2003, Liguori and Sullivan 2014). If it is believed that abieticola or birds resembling it, breed across northern Canada and winter on the Great Plains, then it would be expected to occur with some regularity in Nebraska. Western Red-tailed Hawk at Valentine NWR, Cherry Co 1 Nov 2017. Photo by Joel G. Jorgensen. Status: Common spring and fall migrant and winter visitor statewide. Rare casual summer visitor northwest. Documentation: Specimen: UNSM ZM16366, 26 Sep 1991 Butler Co.
Taxonomy: No pure calurus are known to breed in Nebraska, although intergrades occur in the west (Wheeler 2003). “Dark-colored birds” leave late Feb-early Apr although there are later dates 16 Apr 2017 Buffalo Co, 25 Apr 2017 Scotts Bluff Co, 30 Apr 2018 Lake McConaughy, Keith Co, 8 May 2010 Clay Co, 9 May 2013 and 20 May 2018 Custer Co, and 9 Jun 2017 Cheyenne Co. Rosche (1994) cited extreme dates for dark birds in the Keith Co area 23 Sep-18 Apr. Wheeler (2003) noted that northward movement of adult calurus begins at mid-latitudes in late Feb, peaking in numbers mid- to late Mar, with juveniles straggling into Jun. Summer: In northwest Nebraska there is the possibility of intergrades occurring in summer, as well as the late-migrating immatures into Jun mentioned above (Wheeler 2003). Two, reported as “calurus” by an experienced observer, were along Hawthorne Road, Dawes Co 1 Jul 2003, one was in Smiley Canyon, Sioux Co 25 Jun 2018, and one in Scotts Bluff Co 9 Jul 2015. There are earlier dates 20 Aug 2017 Buffalo Co (no details provided) and 11 Sep 2016 Dundy Co. Rosche (1994) cited extreme dates for dark birds in the Keith Co area 23 Sep-18 Apr. Wheeler (2003) noted that juveniles of calurus begin moving south in mid-Aug, and the northern Great Plains are “filled with incredible numbers of juveniles” in late Sep and early Oct. Taylor and Van Vleet (1888) cited two specimens collected by Baird Aug 1857 near North Platte, Lincoln Co.
Winter: This form winters across Nebraska, with fewer northwestward. Harlan’s Red-tailed Hawk near Lake Wanahoo, Saunders Co 1 Nov 2017. Photo by Joel G. Jorgensen. Status: Uncommon regular spring and fall migrant statewide. Uncommon regular winter visitor east and south, rare casual elsewhere. Taxonomy: Some authors treat harlani as a full species (Preston and Beane 2009, Gill and Donsker 2017, Clark 2018), but the case against this was presented in detail by Sullivan et al (2018) and is followed here. Rosche (1994) cited extreme dates for harlani in the Keith Co 26 Oct-24 Mar. There are specimens of harlani at UNSM covering the period 13 Nov-28 Mar. Dark-colored birds are noted as early as late Sep; there is a specimen of harlani, HMM 2806, collected at Tilden, Antelope/Madison Cos 30 Sep 1918. Winter: This form winters in highest numbers in the east and in the Platte and North Platte River Valleys (Wheeler 2003, eBird, accessed December 2017). Away from these areas, there are only about 15 records. 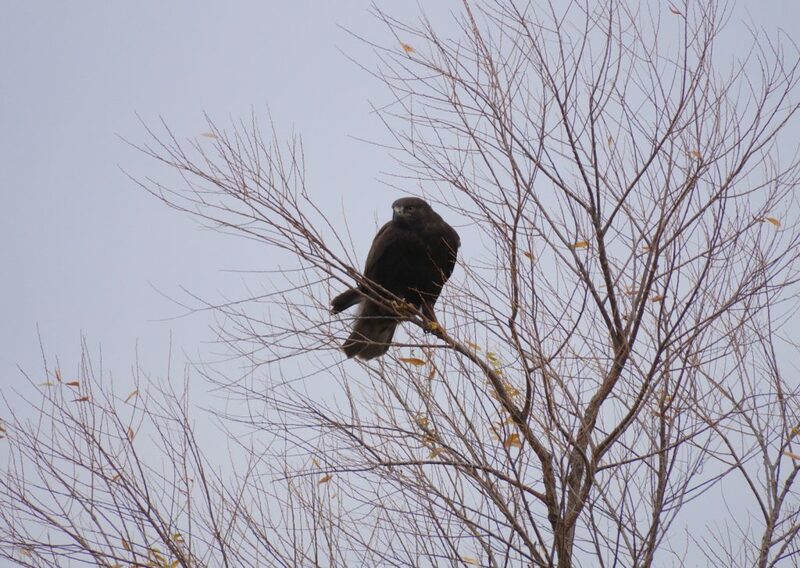 The North Platte CBC 28 Dec 2013 found a count high there of six harlani among the 33 Red-tailed Hawks reported. Arthur, N. 2018. Checklist S42440427: 13050 N 14th St, Raymond US-NE (40.9395,-96.7005), Lancaster County, Nebraska, US. eBird.org, accessed 16 Jun 2018. Carriker, M.A., Jr. 1902. Notes on the nesting of some Sioux County birds. Proc. Nebraska Ornithologists’ Union 3: 75-89. Clark, W.S. 2018. Taxonomic status of Harlan’s Hawk Buteo jamaicensis harlani (Aves: Accipitriformes). Zootaxa 4425: 223-343. Liguori, J., and B.L. Sullivan. 2014. Northern Red-tailed Hawk revisited. Birding 67: 374-383. Manning, S. 2018. Checklist S41919712: Highway 75, Otoe County, Otoe County, Nebraska, US. eBird.org, accessed 16 Jun 2018. Sullivan, B.L. J. Liguori, M. Borlé, F. Nicoletti, K. Bardon, J. Lish, N. Paprocki, B. Robinson, and S. Bourdages. 2018. AOS Classification Committee – North and Middle America, Proposal Set 2019-A. http://checklist.aou.org/assets/proposals/PDF/2019-A.pdf. Todd, W. E. C. 1950. 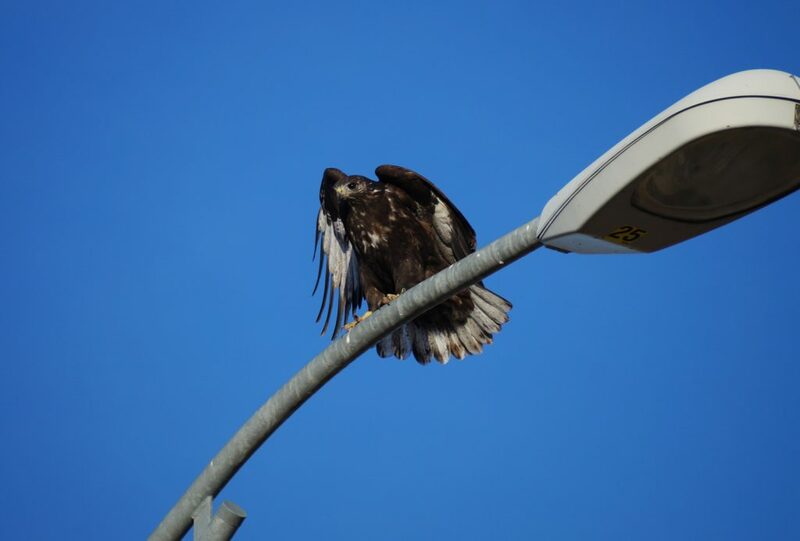 A Northern Race of Red-tailed Hawk. Annals of the Carnegie Museum 31: 289-296.